← Blogoversary – First Post Revisited – A Call For Help! Let’s face it, parenting requires a lot of energy. Mothers pour their hearts and souls into their children’s lives. Fatigue causes many absent minded goof-ups. You buy a week’s worth of groceries, load them in the trunk, hop into the passenger seat, and wait for your husband to get in and drive when you suddenly realize you’re by yourself. You turn down an aisle in the supermarket and go to reach for a turn signal on your shopping cart. You get upset with your child for doing something you disapprove of, but they tell you that you gave them permission. You then recall giving them permission and wonder why you did. You’re about to cook a meal and open a package of food. You throw the food item in the trash and put the wrapper on the counter. After a lengthy search for the food item, you realize what you did, but have no recollection of throwing the food away. You put diaper ointment on your toothbrush. You spray hairspray under your armpits. You tell the friend you’re talking to on the phone, “Hang on a minute,” and go to do something. Then you forget all about the friend you left hanging on the phone. You put the dry cereal in the refrigerator and the milk in the cupboard. Here’s an incident from years ago when cell phones were much bigger: You grab your cell as you’re rushing to the school office. Once there, you set your cell on the counter, waiting for the secretary to help you. She looks at you with a puzzled expression and asks why you brought your remote control. You’re in a hurry and drive through a fast food restaurant to get a quick dinner for the family. You pay for the order and get halfway home when you realize you drove off without the food. You pay the cashier at the gas station for $25 of gas on pump #3. As you’re driving down the freeway a couple miles down the road, you realize you forgot to pump the gas. You have a hectic day running many errands. When you get home, you put your feet up to sit back and relax. You’re horrified when you look down and notice that you’re wearing two different shoes. People ask how old your baby is. You answer, “He’s a seven-month-year-old. You realize you misspoke and added the word “year,” but you still say it every time someone asks. Your lips are chapped. You grab a tube of chapstick off the kitchen counter and apply it to your lips as your husband stands there gawking at you in disbelief. Then you notice that you used your six-year-old’s glue stick, not chapstick. So, moms, when you find yourself doing silly things, rest assured that you’re not alone. I hope you have a wonderful, relaxing Mother’s Day. one of her six great-grandchildren. Have you done any nutty things, due to fatigue? Or do you have a special memory of your mother that you’d like share? I love to hear your comments! relating to any topic, I’d love to hear form you. My thanks to everyone who has contributed to this series. This entry was posted in Uncategorized and tagged humor, Mother's Day, Parenting. Bookmark the permalink. Lynn, you have an awesome Mother's Day! This explains a lot with what my parents are going through. My dad has been very fatigued being a caregiver for mom and has made some really weird goof ups lately. We got the situation straightened out and have her in an assisted living facility and dad is starting to come back from it after a couple weeks. I'm becoming a Mum for the first time in September, and the scary thing is that I already do all these things! I guess it's all downhill from here! Your list certainly brought back happy memories! Hope you're having a happy mothers day! Alex – Aw, thank you!Michael – I heard about a study that shows being a caregiver takes quite a toll on the caregiver and can affect their health in many negative ways. So sorry your mom has to be in assisted living now. That's not an easy decision to make, but it sounds like she's better off and I'm glad to hear your father is doing much better, too.Angeline – Congratulations! How exciting for you, expecting your first child. My daughter called it prego brain while she was pregnant, and now she calls it mommy brain! OC – Yes, that's my mum. Thank you! I think she's beautiful, too! Jemi – Thanks for visiting my blog. Yes, I think we've all had moments like these. Some of us more than others! LOL!Nas – Aw, I'm glad this list brought back happy memories. I had a great Mother's Day at Dodger Stadium with one of my daughters, her hubby, and his family. I hadn't been there in 40 years! Karen – Haha! Yes, even men have absent minded moments. They're not quite as open about admitting it, though! Haha! I have picked up my phone and pressed the numbers and couldn't figure out why the TV wouldn't turn on!I also find myself using my blinker to turn into my garage which is behind my house! This morning I addressed a blogger by the wrong name and had to quickly email them to change it to their name. Some Mondays are ridiculous!Great post as usual Lynn! Susie – Those are funny examples! LOL! I'll save your comment. I've done that before, called a blogger by the wrong name, mainly because I read it wrong. I felt so stupid because the name I typed out was kind of funny and I wondered how someone could have a name like that. I wish I could remember what is was. LOL! My mom was well known for putting the washcloth in the fridge, and dirty socks in the toilet! Then of course the good ol' walk into a room for something then forget what. It's so pervasive my daughter calls this "having a Pat-Pat (what she calls my mom) moment." Thanks for the LOLs and hope you Mothers' Day was a good one! Jennette – Your mom must be related to me somehow! Hmm, my maiden name is Powell! These are the kind of things I do. I love how your daughter calls it "having a Pat-Pat moment." Thanks! Great stuff for my next post about absent-minded moments! I had a wonderful Mother's Day. I hope you did, too! So funny! I just read them out loud to my husband. Loved the one with the cell phone/remote control–I put the remote in the fridge once. Plus many other silly things :)Hope you had a happy mother's day! Love these stories, Lynn! 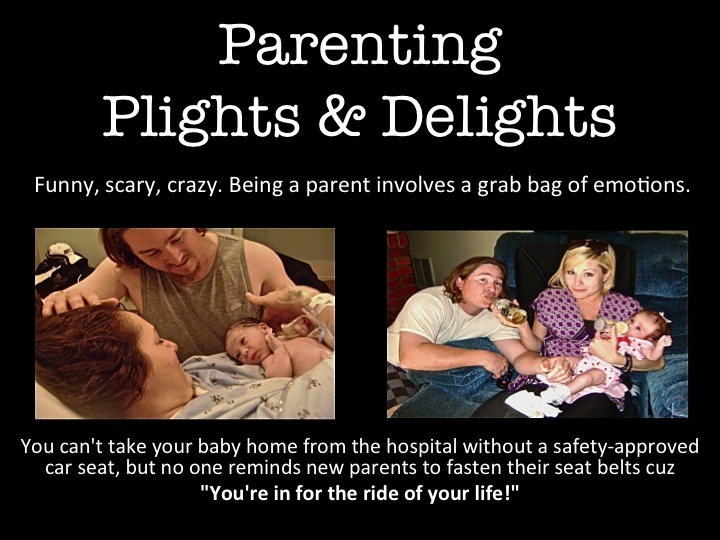 I think all moms can relate =DAnd thanks so much for the advice you left on my blog! It's very much appreciated! Hi Lynn, I'll ditto others in that this was a great post. I found your blog by way of Alarna's blog.I never attributed my odd actions to fatigue, but that may be the cause as I work two jobs along with trying to keep up on my writing.I have to watch and not pour my flavored creamer into my cereal and the milk into my coffee, yuck.You call your blog Random Acts of Weirdness. I think we're all a bit weird in our own ways. Well I certainly didn't expect this to take my name out and put one of my blogs there.